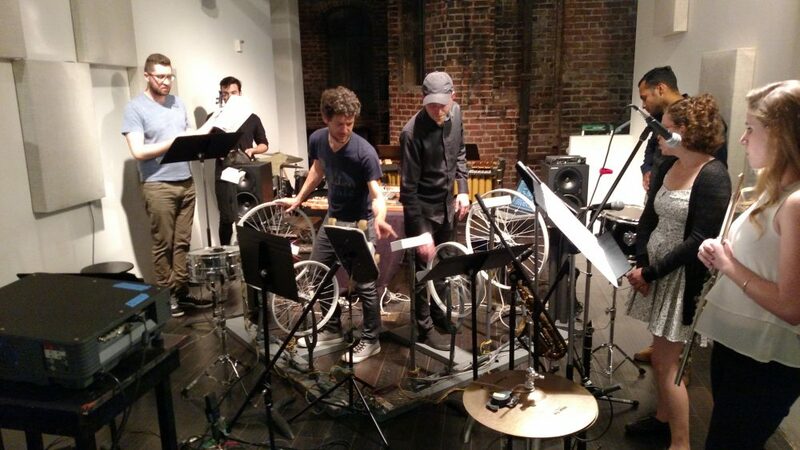 Now Hear Ensemble set up for Cycles in San Francisco, May 20, 2015. World Premiere: May 15, 2015. Now Hear Ensemble. UC Santa Barbara. I was commissioned to write Cycles for a bicycle-themed program by the Now Hear Ensemble, specifically to make use of an electronic controller interface using bicycle wheels, designed by Swedish composer Anders Lind. Sensors are attached to the wheels that transmit data as they spin, allowing for the control of electronic parameters using custom-designed software. The concept appealed to me, as I am always looking for new ways for performers to interact with electronic music and to avoid the use of preset backing tracks. The idea of spinning wheels brought to mind the concept of musical cycles, and so I set each wheel to control a different repeating rhythm, creating a complex web of polyrhythms. The electronics begin as pure tones and over the course of the piece gradually progress to glitchy noise. The clarinet and viola weave in and out of the electronics, themselves alternating between pitched patterns and noisy gestures.